Innovative neurostimulation therapies require improved electrode materials, such as poly(3,4‐ethylenedioxythiophene) (PEDOT) polymers or IrOx mixed ionic–electronic conductors and better understanding of how their electrochemistry influences nerve growth. 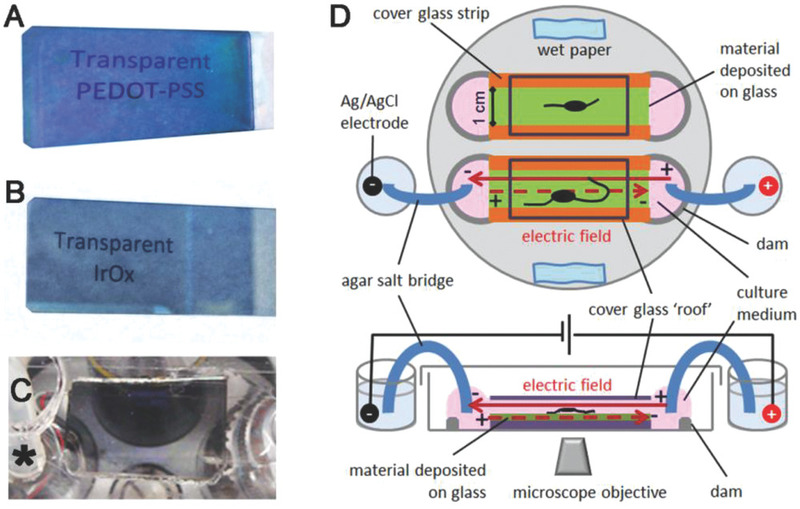 Amphibian neurons growing on transparent films of electronic (metal) conductors and electronic–ionic conductors (polymers and semiconducting oxides) are monitored. Materials are not connected directly to the power supply, but a dipole is created wirelessly within them by electrodes connected to the culture medium in which they are immersed. Without electrical stimulation neurons grow on gold, platinum, PEDOT‐polystyrene sulfonate (PEDOT‐PSS), IrOx, and mixed oxide (Ir‐Ti)Ox, but growth is not related to surface texture or hydrophilicity. Stimulation induces a dipole in all conductive materials, but neurons grow differently on electronic conductors and mixed‐valence mixed‐ionic conductors. Stimulation slows, but steers neurite extension on gold but not on platinum. The rate and direction of neurite growth on PEDOT‐PSS resemble that on glass, but on IrOx and (Ir‐Ti)Ox neurites grow faster and in random directions. This suggests electrochemical changes induced in these materials control growth speed and direction selectively. Evidence that the electric dipole induced in conductive material controls nerve growth will impact electrotherapies exploiting wireless stimulation of implanted material arrays, even where transparency is required.